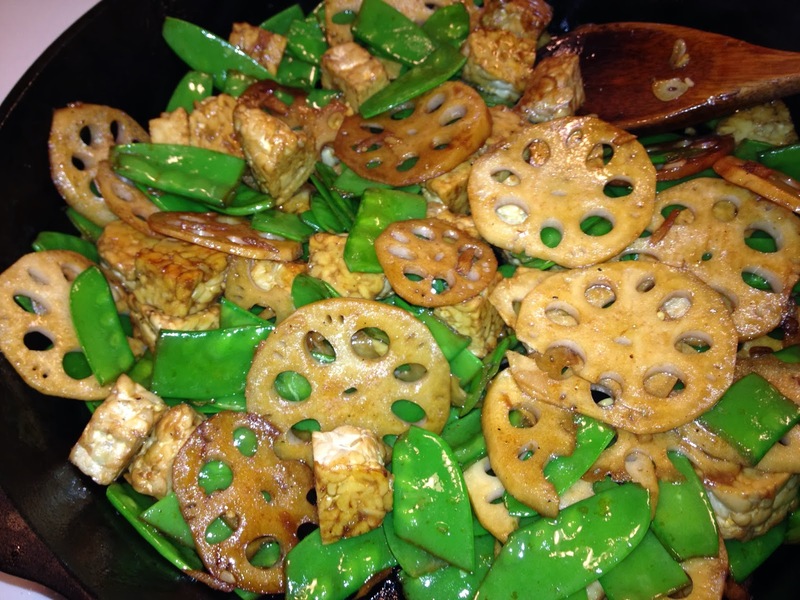 Top is a stir-fry with snow peas (not a root vegetable, I realize, but they needed to be used), tempeh, and lotus root, seasoned with tamari, galangal, and garlic. Lotus root is irresistibly elegant, and is crunchy-starchy in texture, fairly bland in taste. I don’t have a pond so I won’t be growing it anytime soon, but I’ll definitely buy it again now that I know how simple it is to prepare. I have more in the fridge and plan to try making chips. Galangal is a close relative of ginger (often called Thai ginger) that has a stronger and more complex flavor; it mellowed a lot on cooking. Bottom is roasted radish (one of my new favorites! ), celeriac, sunchoke, sweet potato, and purple yam. The last is a true yam, not a sweet potato, and it started out pale purple and darkened as it cooked. Not as sweet or distinctive as my purple sweet potatoes, but tasty. That looks gorgeous and seriously yummy. I love galangal. It is a very common spice in Indonesian cuisine, called laos. I have used it since I started cooking as a teenager. In fact, I would love to grow it, just like I am growing ginger, but I haven't food a source. I also have a pond so I would love to grow lotus as well. Same goes for Sunchokes but I refuse to buy them. I mean, $22.88 at Johnny's for 1 1/2lbs of Sunchokes that will be a nightmare to control within one growing season. I wish we had some Asian markets here on the Eastern Shore. Replying in email! We are going to try gradually transplanting our sunchokes into a container this year, but it'll be a battle to dig up all the ones in the ground. 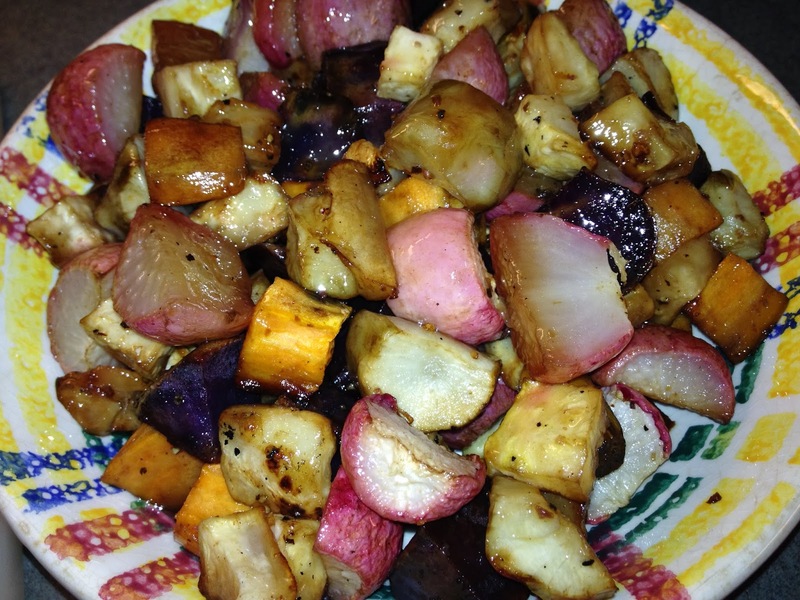 How do you get an even roast with different root vegetables? Onions cook too much. Carrie not enough. What temp? How long? For me it's been trial and error, though I'm sure there are guidelines somewhere. All the ones in this dish happened to cook evenly by luck! If I know something will take longer, I boil it for ten minutes or so first, and then add it to the pan with the others.